Ahhhh home in Hawaii! Pretty scents of pikake and plumeria during morning walks in the neighborhood, brilliant and deep greens driving through rain scented valleys, sweet tart lilikoi you can taste the sun in each one picked off the vine. This is where I create new flavors of gelato fusing the natural beauty of our Island flavors with the techniques and flavors from my travels. New flavors like delicate floral pikake with earthy sweet Mexican horchata–rice milk infused with cinnamon, or the comforting taste of matcha green tea in smooth creamy coconut haupia and spicy fragrant ginger tamed by sweet creamy Island milk. Each velvety scoop is flavored with the love, sun and colors of our Islands. In the September 2012 issue of Hawaii Business, blogger Catherine Toth asks, “How much does it cost to start up a business?” Among the entrepreneurs profiled was Bow. Want more? Check out Melissa Chang’s writeup for Nonstop Honolulu last month, this profile by Martha Cheng in Honolulu Magazine from July. 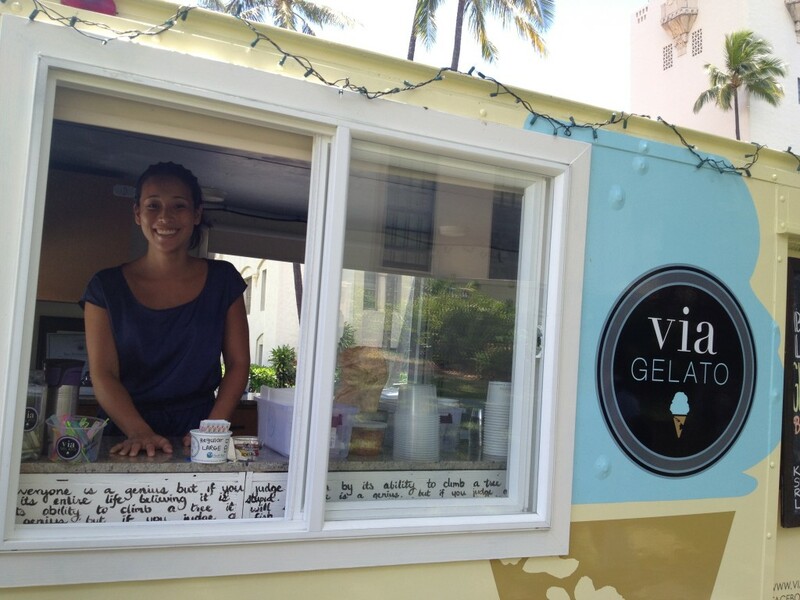 Follow Via Gelato on Twitter at @VIAGelato, on Facebook, or check out the blog.